What is Restaurant Week on The Hill? Restaurants on The Hill are coming together to form the 8th annual “Restaurant Week on The Hill.” Restaurants will offer a three-course pre-fixed menu starting at $25 & $35. There are no coupons to carry, or cards to purchase ahead of time. Diners will show up to participating restaurants and be offered the special three course menu. The purpose of “restaurant weeks” are to drive business to local restaurants while offering diners the chance to enjoy an old favorite, or experience something new for an affordable price. Young Friends of Mercy is a group passionate about giving back to their community by raising funds for Mercy Health Foundation to support initiatives that directly impact patient care at Mercy Hospital St. Louis. Young Friends is excited to support Mercy’s Child Life Program. 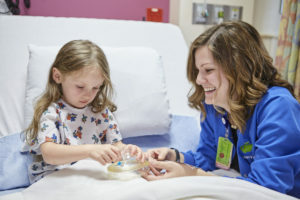 Child Life specialists help infants, children, youth and families cope with the stress and uncertainty of illness, injury, trauma, disability, loss or bereavement during their hospital stays. For kids who spend time at Mercy, whether it’s a long stay or a visit to the ER, our Child Life Program makes a world of difference. It takes more than medicine to heal a child. 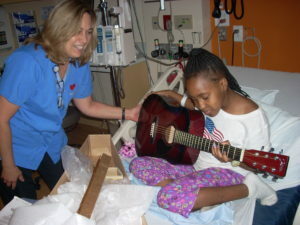 It’s through play and fun activities that our specialists help the healing process for our youngest patients. This service is not reimbursed by insurance and is funded through philanthropy.